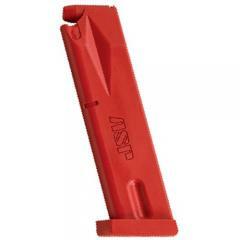 This Beretta Training Magazine from ASP's Red Guns line perfectly mimics the size and shape of a genuine Beretta pistol magazine. Unlike the real thing, though, it is completely inert, making it totally safe to use for law enforcement training scenarios. The training aid is made from durable, wear-resistant urethane, so you can use it over and over again in instructional drills. Its light weight makes it easy to handle and reduces the chances of injury. The magazine replica is colored bright red, making it extremely visible and impossible to mistake for the genuine article.